The term ‘HGV’ is wide and encompasses any vehicle which is classed as ‘heavy goods’. 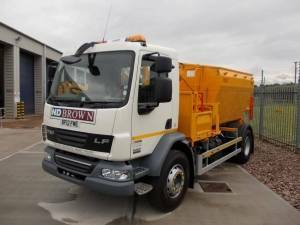 Here at ND Brown we provide a wide range of HGVs for industrial, commercial or domestic use. We focus mainly on the utility, civil engineering, municipal and highway maintenance sectors, but have worked with a wide range of industries over our time in business. Our HGVs vary in size and type ensuring that whatever you need, we’ll have something to suit your requirements. Construction projects can be tricky in London, with tight time schedules, restricted space and complicated road systems. Our experience providing HGVs throughout London means we’re familiar with the intricacies of the London area and project planning and can provide fast and efficient HGV wherever you require it. Our drop off and collection service also improves the customer experience, and enables our vehicles to work in to tight schedules and deadlines. Interested in our HGV hire? We pride ourselves on the wide variety of vehicles we have available, below are just a selection of our most popular HGV hire options. Tippers and tipper grabs are one of our most popular hire options. Their rear or side tipper bodies are perfect for transporting heavy items and construction materials. We offer tipper hire from a small 3.5 tonne model, to a large 32 tonne tipper – with many options in between. In addition to this, our tipper grabs incorporate a crane feature into the tipper design, for heavy lifting and construction projects. Cage tippers function in much the same way as tippers and tipper grabs, but they have a large cage structure. Our 7.5 tonne cage tipper is available for hire throughout the country. Hotboxes are an integral part of road repairs, maintenance and construction and so are in demand throughout the year. We have 7.5 tonne, 12 tonne, 18 tonne and 18 tonne with either a side tipper or road mender available. Whether you’re searching for HGV hire for a couple of weeks, or need a long term contract – we’ll have a vehicle and package suited to your needs. If you would like any further information then please get in touch with our expert team who can advise you on the right type/size of HGV for your needs.